BACK IN STOCK!!! 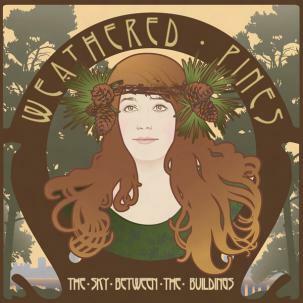 WEATHERED PINES was formed in 2006 by lead vocalist and songwriter, MARISSA JOHNSON, who has performed live and on record with NO KIDS (Tomlab). With influences such as Neil Young, Elvis Costello and Gram Parsons, Weathered Pines blends bottom-of-the-bottle country with a hint of rock ‘n’ roll grit. This has led them to be equally as likely to appear on a bill next to country sweethearts Carolyn Mark or Jenny Whitely as they are next to total rockers Vancougar or the Tranzmitors. The band’s debut release, The Sky Between the Buildings, is the first offering from Dejlig Records, the Vancouver-based sister label of Nominal Records. This eleven-song album of lovely country songs is available on vinyl and includes a digital download coupon. Artwork for the record was designed by Marissa Johnson. Initial pressing of 519.